Ken Halla, the blogger behind the US History Teachers Blog, has been working on an excellent new site for students of US History. The new site is called ContextU and its purpose is to help students see the greater context for significant events in history. The first iteration of ContextU is focused on the American Civil War. On ContextU students select from a table of contents an event, piece of legislation, or theme to see it in the context of other events, pieces of legislation, and themes leading to the start of the Civil War. Through timelines, Google Maps, diagrams, flow charts, timelines, and text ContextU provides context for each chosen event, piece of legislation, or theme. Students can jump from event to event or from theme to theme by following the hyperlinks within each diagram. ContextU is still in development, but what is available now is already quite good. 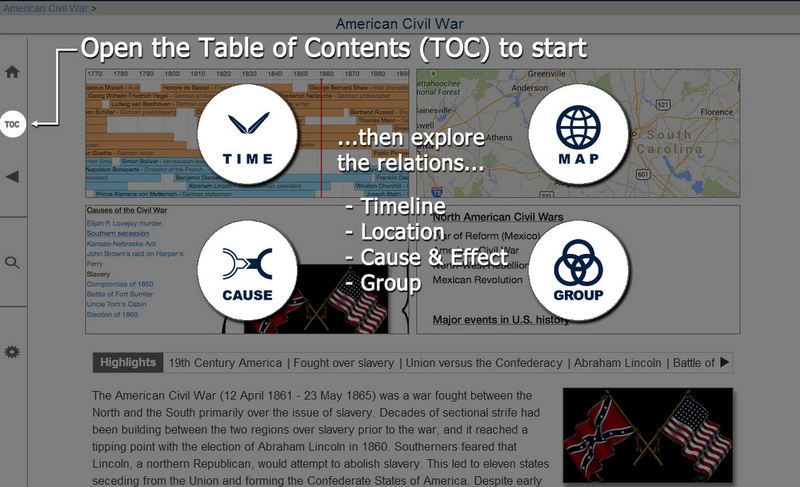 The advantage of ContextU over a textbook as well as many other websites is the ease with which students can see how an event fits into the larger context of the causes of the American Civil War.